My collection of Lonely Planet and other miscellaneous guide books. Visit a City — Create your own travel guide. This interactive website does a fairly good job in suggestions sites for many popular cities. There are some great features such as displaying sites on a Google Map but the best is the estimated time you need for a site. Nomadic Matt’s step-by-step guide to backpacking Europe — Nomadic Matt is well known in the travel community and this is an impressive guide because I think he covers all the things you need to know. WikiTravel — a crowdsourced travel guide. A great place to find out how to get in and out of an airport. Rick Steves’ Europe — As the name implies, Rick specializes in Europe. In addition to some good planning tools, you can download some free self-guided walking tours here. Lonely Planet — Although you won’t get the full content via its website, there are very few countries that Lonely Planet hasn’t covered. Check YouTube for some of their shorter content. 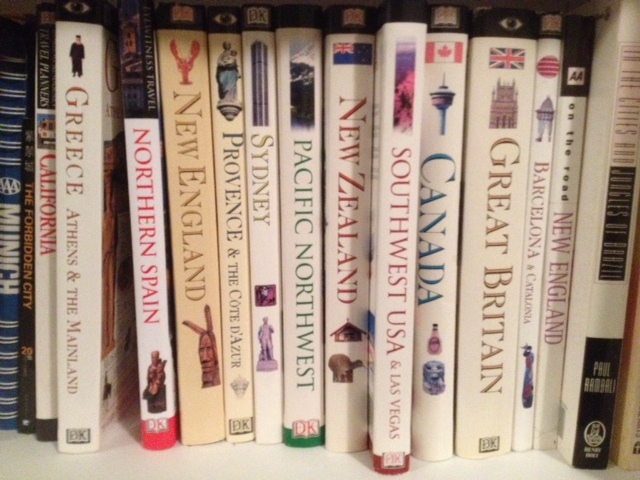 Fodor’s Travel — some good resources courtesy with a decent discussion forum. Frommer’s Travel Guides — The founder Arthur Frommer and his daughter Pauline just bought Frommer’s Travel Guides back from Google. In his 80s now, Arthur is still travelling and blogging. Tourism Offices Worldwide Directory — an easy to search function at this site. If you can’t find the official website here, just Google it. If you plan ahead, you can often ask for printed material to be sent to you. However, many of them have switched to digital content only. Printed Guides: When I travel, I still prefer to have a paper copy guidebook. I have used all of the following and they are all good. They are all available as eBook format as well. In fact, you an purchase a chapter or two rather than the entire book. Lonely Planet — It’s hard to think of a country that Lonely Planet hasn’t covered. In fact, they came out with a guide for Afghanistan a few years ago! Rick Steves’ Guide to …. — Rick covers Europe extensively. I found his self-guided tours fairly easy to use. He also recommends smaller independent hotels in great locations. EyeWitness Guides — Colourful and with 3-D maps. Let’s Go Guides to … — A popular series for younger crowd. It is good to know where the hipsters hang out in case you want to join or avoid them. Podcasts: I listen to the following three free programs regularly. Since both Amateur Traveler and Rick Steves’ Travel have been ‘on the air’ for awhile, it has a fairly extensive archives. This Week in Travel covers the latest travel news and is hosted by three knowledgeable hosts: Gary Arndt, Chris Christensen, and Jen Leo. Amateur Traveler — Chris Christensen is the host of this weekly podcast and episode 394 was just released a few days ago (Nov. 8, 2013). His guests usually know quite a bit about the place and I found the information current and informative. This Week in Travel — Doesn’t actually come up weekly but it’s fairly regular. The news is current and the advice are good. Rick Steves’ Travel — Although more famous for his TV show, Rick does a radio show as well.